I put together these photos to show the variation that occurs with the Iceland Gull complex on the west side of Lake Michigan, where all of these birds were seen. The Iceland Gulls on this page belong to the subspecies Larus glaucoides kumlieni, the "Kumlien's" Iceland Gull, and Larus glaucoides thayeri, the "Thayer's" Iceland Gull. Adult Kumlien's have varrying amounts of gray in the outer primaries, as can be seen in the photos below. 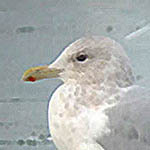 The nominate subspecies of Iceland Gull, Larus glaucoides glaucoides, has not been officially recorded in Illinois and is not to be expected. All photos were taken with a Questar telescope and a Fujifilm digital camera, a technique known as digiscoping. See my Digiscoping with a Questar page for details.